In 1932, on the banks of the River Nile, an ancient Pharoah's tomb has just been discovered. The first archaeologist to enter the long-lost tomb of Pharoah Shudnadundat has suddenly been struck down with a fatal illness. Over the course of a dinner party you must unravel the mystery and solve this intriguing whodunnit. 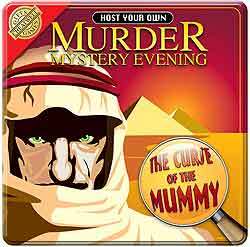 Each guest plays a suspect as you seek to discover the true nature of the curse.